I have admitted before that I, your gallant reviewsmith, actually wasted money on a real Sega CD when it first came out. Point of fact, I still have it, in its original box, and I assume it still works. I still have it, because I can’t get anyone to buy it. Regardless, purchasing a Sega CD was almost worth it in the end, simply because it had a number of truly exceptional titles, (most of which were just ports from Japan) which that never made it onto any other system. Snatcher is one such triple-A title. Road Avenger is up there as well. Road Avenger is an animated “reaction” game similar to Dragon’s Lair. In these sorts of games, a linear movie plays out until you get to one of numerous interactive sections – in Road Avenger, these come every few seconds. Icons will flash on the screen, indicating what button you should push. If you press the correct button within a short amount of time, the movie continues. If not, you die right there. This was kind of tedious for Dragon’s Lair, but due to the speed and nature of Road Avenger, it works extremely well. The game begins as you, a hotshot cop, and your wife, a blushing bride, have just been married and are driving off to your honeymoon. And like George Lazenby learned in On Her Majesty’s Secret Service, if you’re in any realm of law enforcement and have pissed people off in the last few months, you should never, NEVER, take your brand-new wife “for a drive” on the coast. Sure enough, a biker gang catches up with you and forces your car off the road. As your wife gets broiled in the wreckage, you vow to go Mad Max on these boys, and build yourself a custom, turbocharged Trans-Am of death. Cutscene ends, game begins. 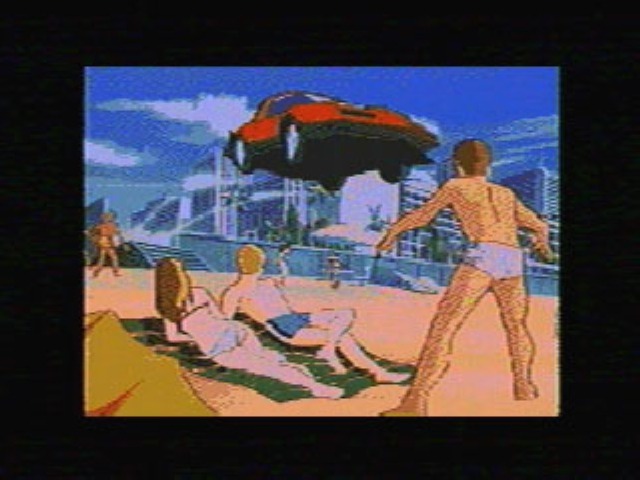 One thing no one really seemed to learn about the Sega CD was that Cinepak video footage, while technically able to play on the system, did not look too hot. On the other hand, cell animation looked just fine. Road Avenger’s crisp anime not only gives it an awesome personality and style, it allows it to overcome the technical problems that would have ruined a game like this if it was shot on video. 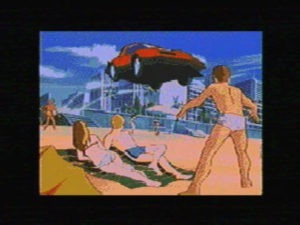 The result is smooth, fluid animation from start to finish, with plenty of detail and action across the screen, and surprisingly little pixelation or blending. Considering that the game is all about driving at top speeds while dodging cars, bullets, and explosions, the choice to go anime is sweet perfection. When describing the gameplay, it sounds as if it would terribly laborious. You watch a few seconds of the movie, see an icon flash on the screen, press the corresponding button, and move on. However, while actually playing the game, it is the furthest thing from boring. The smartest thing the designers did was to make the interactive sections absolutely seamless. The game never pauses, never takes you out of the action for a second. The video is created right up to the point of impact, the icon starts flashing a second or so before, and if you miss it, boom. If you don’t, the animation picks up instantly as you swerve away from the hazard – so seamlessly that you wouldn’t even know you just branched along a different path. The interaction is also completely logical. If a biker is roaring at your front left side, the arrow pops up pointing you to the right. If a car stops in front of you, you hit the button for your brakes. What you should do in these situations generally makes so much sense that there is an option to play the game without icons, and only tones to cue you in on when you need to react. Surprisingly, it’s totally playable. There’s never a dull moment in this game. Whether you’re hitting nitrous to speed between two trucks, flying off a ramp through an explosion, or crashing through the lobby of a hotel, there’s plenty of action on screen at all times. Your view is kept locked behind the wheel of the car for the vast majority of the game, which is not as restrictive as it sounds, because you’ll frequently switch to outside views as your car does another amazing stunt. These camera angles don’t take you away from the immersion at all, and you’ll never have to make a quick reaction for at least a second or two after you switch back into your car – so you can’t blame sudden death on a disorienting camera change. The game is completely linear, but that allows it to maintain brilliant control over these kinds of situations, and the pacing of the action. The graphics here are clean and sharp for the Sega CD, with great direction by the animators. Stunt-cam cutaways look like shots out of the best animes, and even the action from inside the car is fast and furious without ever hindering you from knowing what’s going on around you, as a constant first-person view would be expected to do. The animation looks as good as anything you would see on an 90s Saturday morning, but with the darker look and feel of the action animes of Adult Swim. That’s saying something. At the very least, it’s saying that you’re going to be entertained if you like action films. You might cream yourself if you’re an anime fanatic, because you’re pretty much playing a very quality anime. Road Avenger has some excellent and fitting music, and a reasonably memorable main theme. The in-game music is mostly fast-action rock that seems actually scored to the game. It’s CD quality, obviously, and redbook, if you like it so much you want to throw it in your car. Audio effects are also of a high caliber, and you can pretty much imagine what is involved here. If you guessed flames, crunching metal, shattering glass, etc, you win the prize. Your car has no weapons whatsoever, and neither do you. Despite this, you’ll be avenging upon scores of gang members, and out-driving every one of them. I wouldn’t start making comparisons to Bullit, but there are a large number of great, memorable sequences in the game. Somebody did their homework on this game, and knew how to make great car chases and vehicular action. The game is probably very hard to find, but worth grabbing if you ever cross paths. It is just a linear, interactive film, but it’s an excellent one, and surprisingly, an excellent game as well. Fantastic action anime with intuitive controls. Somewhat short, completely linear, but still worth coming back to.